Barrie was the ninth of ten children born at 4 Brechin Road, Kirruemuir, Angus. Barrie was traumatized as a young child when his fourteen-year-old brother (and his mother's favourite), David, died in an ice-skating accident. James, acutely sensitive to his mother's devastation, did his best to fill his brother's place in her affection, even going so far as to wear his clothes. In his biographical account of her (Margaret Ogilvy, 1896), he described a time when he entered her room, and heard her say, "'Is that you?' I thought it was the dead boy she was speaking to, and I said in a little lonely voice, 'No, it's no' him, it's just me.'" She later found comfort, though, in the fact that her beloved son would forever remain to her a boy, never to grow up and leave her. Some Barrie biographers have suggested that this trauma may have accounted for his reported asexuality. Barrie's first novel, Auld Licht Idylls, appeared in 1888, followed by A Window in Thrums in 1890 and The Little Minister in 1891. Although critical failures, these early works were commercial successes, and they enabled Barrie to make a career out of writing. 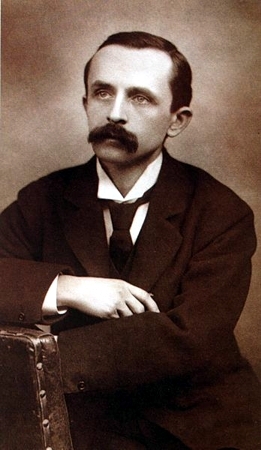 His attention increasingly turned toward theatre-writing, and he had back-to-back success at the turn of the century with Quality Street and The Admirable Crichton. 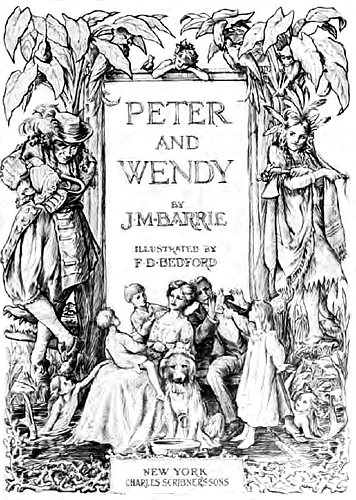 Peter Pan, the character who would evolve into an icon of the English-speaking world's cultural consciousness, made his first appearance in 1902's The Little White Bird. 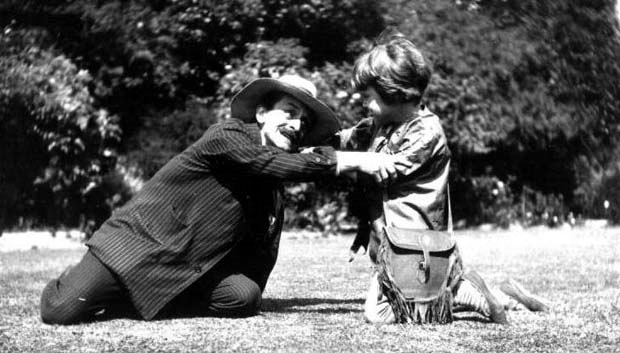 Two years later, on 27 December 1904, Peter Pan, or The Boy Who Wouldn't Grow Up, made its stage debut in London, with Nina Boucicault in the titular role. 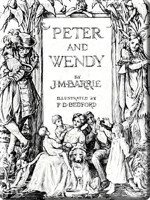 The play appeared in novel format in 1911 as Peter and Wendy, and Peter Pan, Tinkerbell and Captain Hook slowly became household names. Barrie drew on many real-life inspirations for his characters. In the 1890s, he and his wife, Mary Ansell, took habit of walking their gentle Newfoundland dog, Porthos, in Kensington Gardens. Barrie, delightfully fond of children, entertained the children who gathered to pet the dog by wiggling its ears. Porthos appeared as himself in The Little White Bird, and as Nana in Peter Pan. 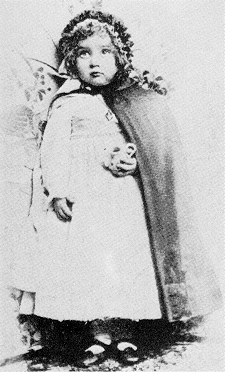 Many children at the Gardens grew to adore Barrie, including little Margaret Henley, who died at the age of six. She affectionately termed Barrie "my friendy," which came from her mouth as "fwendy." 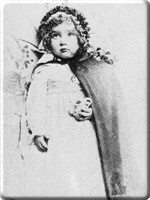 Wendy Darling's name came from young Margaret's nickname for Barrie, and her cloak was modeled on the one worn by Margaret in the photograph to the right. Perhaps the biggest influences, however, were the five Davies boys, sons of Arthur and Sylvia Llewelyn Davies. 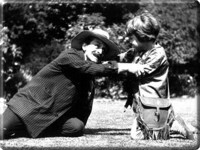 The Barries became intimate friends with the Davies after meeting in Kensington Gardens in 1897, and James frequently visited Sylvia at her home. In 1901, Barrie invited the Davies to his cottage at Black Lake, and made a book, The Boy Castaways of Black Lake, from numerous photographs he and Sylvia took of the boys playing pirate games. 3 This personal album became the foundation for the concept of Peter Pan. George and Michael Davies served as the character models for Peter, who was named for the middle son. 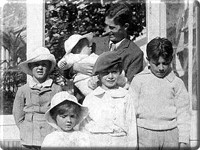 When Arthur died in 1907, Barrie became less of an "Uncle" to the boys and more of a father-figure, going so far as to financially support the family. After Sylvia died three years later, Barrie - now a bachelor after having sued his wife for divorce on the grounds of infidelity in 1909 - became trustee and guardian of her sons, along with their nurse, Mary Hodgson. Barrie and the nurse acted as surrogate parents for the boys until they were all in school. 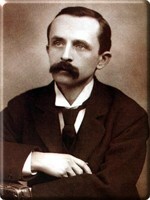 Barrie ran in London's high literary circles, counting George Bernard Shaw, Robert Louis Stevenson, H. G. Wells, and George Meredith as his companions. He founded an amateur cricket team with fellow writers Sir Arthur Conan Doyle, A. A. Milne, Walter Raleigh, and G. K. Chesterson. 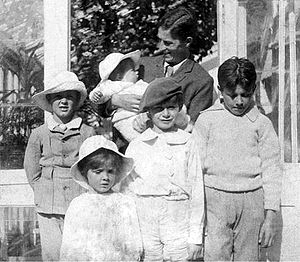 He was named godfather to the son of Antarctic explorer Robert Falcon Scott, and even entertained the young daughters of the Duke of York, future monarch Elizabeth and future princess Margaret, with his stories. Barrie was made a baronet in 1913, and made a member of the Order of Merit in 1922. When was asked about Barrie some time after his late guardian's death, Nico Davies mused, "He was an innocent - which is why he could write Peter Pan."